I do realize that most people that eat these little lovelies call them Whoopie Pies. 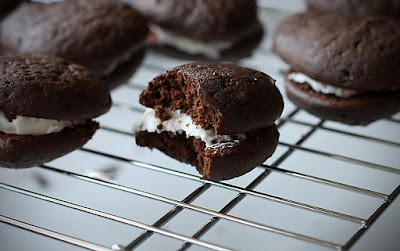 However, I make them small, so we refer to them as Whoopie Cookies around here. These are T-R-O-U-B-L-E, I'm telling ya! Don't say I didn't warn you!!!!! To make the cookies, heat the oven to 350 degrees. In a medium sized bowl, stir together flour and cocoa and set aside. In a small bowl, dissolve baking soda in hot water and then add the milk and set aside. In another bowl, beat the shortening and sugar with a mixer until fluffy. Add the egg and beat another minute. Mix in half of the dry ingredients and then half of the wet ingredients; repeat. Drop the batter by heaping teaspoons, about 2 inches apart, onto an ungreased cookie sheet. Bake for 8 minutes. Cool thoroughly before removing from cookie sheet and make sure they are completely cooled before icing. For the frosting, use a mixer and cream the butter, shortening, vanilla and powdered sugar until fluffy. Add the milk, 1 T at a time until the frosting has a creamy consistency. Fill the flat side of the cookies with frosting and put two together to form a sandwich cookie. Makes 2 dozen. And BOY do they disappear FAST!!!!! I'd better not make those... they look so good I am sure I could eat them all! I'm hosting a BC Cookie Cookbook Giveaway on my Cookie website - www.best-ever-cookie-collection.com through the end of the month if you are interested. I've made these before and you are correct on ALL accounts. Feel free to bring those to our next lunch or dinner!! They look yummy!!! I can imagine that they would go quickly! They really look good! I recently have been making cookies for my husband so he can have something fun and sweet with his lunches when he goes to work. I think he will like these, but they sure look fatening! I'll need to try and stay clear of too many of them when I make them cause they look GOOD (smiles)! I only make em when my sister visits so I wont be tempted to eat em all...great recipe!